My first encounter with the elusive orangutan in its natural habitat was over a decade ago in the rainforests of Sepilok. I have distinct memories of a ginger giant swinging deftly from the vines then landing nimbly on the same wooden pathway I walked on, and the way it gracefully strolled past me (in all my gaping, wide-eyed childlike wonder) like it was the most natural thing in the world. To me, a Malaysian, the orangutan - 'orang hutan' - man of the forest - is a national icon and as Malaysian as nasi lemak. However, to many outside of Malaysia, the orangutan is an exotic, mysterious creature which unfortunately has come to represent critical endangerment. A Bornean native, like my grandparents, the orangutan can now only be found in the rainforests of Borneo and Sumatra where they face ever-increasing threats by ways of habitat destruction, poaching, and the illegal pet trade - atrocities by humans, the latter two especially shocking considering that these expressive, highly intelligent creatures are so closely related to us humans (we share about 94% of our DNA) and resemble us so strongly. This is where the Sepilok Orangutan Rehabilitation Centre, in the East Malaysian Sabah District of North Borneo, steps in. Over 50 years ago, an English lady set up the first centre in the world dedicated to the rehabilitation of orphaned orangutans, in 43² km of virgin lowland equatorial rainforest on the edge of the Kabili forest reserve. Orphaned orangutans who've lost their mother to poachers, deforestation, and logging, are found - sometimes terrified and doomed to certain death in the rainforest, sometimes shivering in cages where they are kept as exotic pets - and taken to SORC where they are nursed back to health and to begin a rehabilitation process as long as 7 years to learn the necessary skills to survive in the wild. 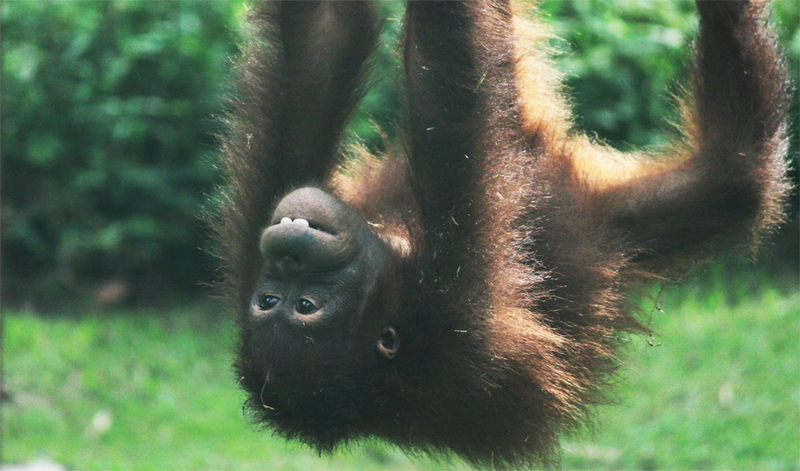 Baby orangutans live in the nursery where there are cared for, receiving the emotional support they need and learning skills the from the older orphans like climbing and foraging skills. Eventually, the babies are weaned off emotional attachment to their carers - necessary if they are to return to the wild - and released into the surrounding forest reserve to fend for themselves. Curious visitors - Henry and I included, it was his first time in Borneo! 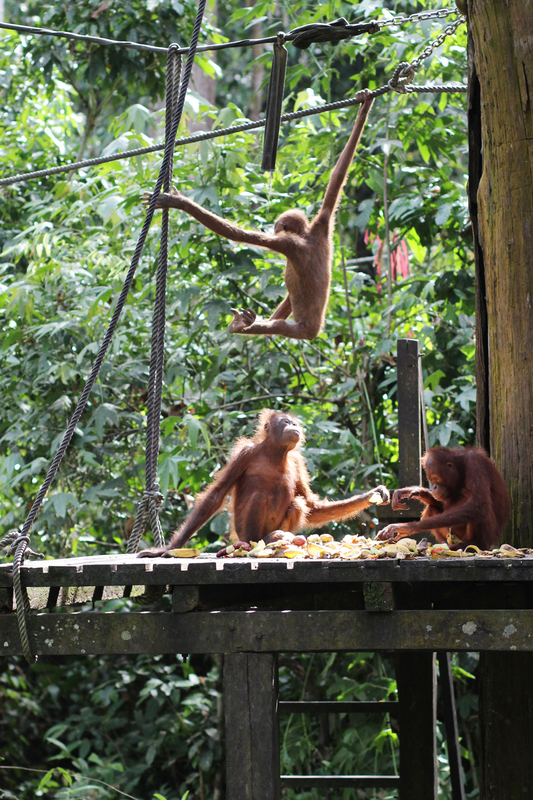 - visit Sepilok Orangutan Rehabilitation Centre to see these sweet creatures being fed (twice daily; 10am and 3pm). Some wild orangutans show up for a free meal - a purposely monotonous offering of bananas, fruit and milk to bore them so as to encourage them to look for their own food - and there can be as many as 5 at a time, but of course the less orangutans appear for these meals the better, as it means that they have become truly wild and can look after themselves. It's important to remember that SORC is not a zoo, and that to see an orangutan is a privilege not a right, and again, the fewer orangutans you see at feeding time the better it means for the survival of the species. We walked along the wooden pathway into the rainforest toward the observation deck from which we would see the orangutans. Spotted: the Bornean sun bear, the smallest in the world. 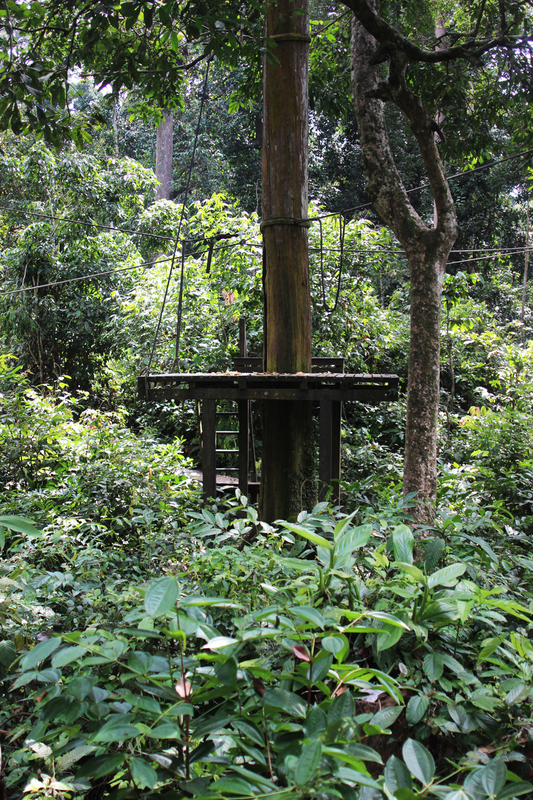 Sepilok is also home to the Bornean Sun Bear Conservation Centre. As the SORC is now a well-known destination for locals and tourists alike, the observation deck is often crowded with visitors. Unfortunately this means that there will be people on the deck who fail to respect basic rules - keep silent, as noise will discourage the orangutans from showing up for their food - and observe propriety. There were people pushing strollers with screaming babies (no doubt crying from the discomfort of the heat and humidity) and out-of-control children shrieking and whirling like devishes. Babies will cry, children will be children, but what struck me as especially awful were the adults - why would you bring your babies here and risk exposing them to mosquitoes and catching something? And, if you're going to bring your children for God's sake control them, or don't breed! Some of the adults themselves had less manners than monkeys - indeed, the orangutans are far more graceful than some of the visitors - and can't control themselves, stampeding like elephants after every single movement in the trees with GoPros on sticks and shouting to get the orangutans attention. Seriously? They're the real apes. Henry and I took our positions - as quietly as possible, I must add, I was hesitant to even cough! 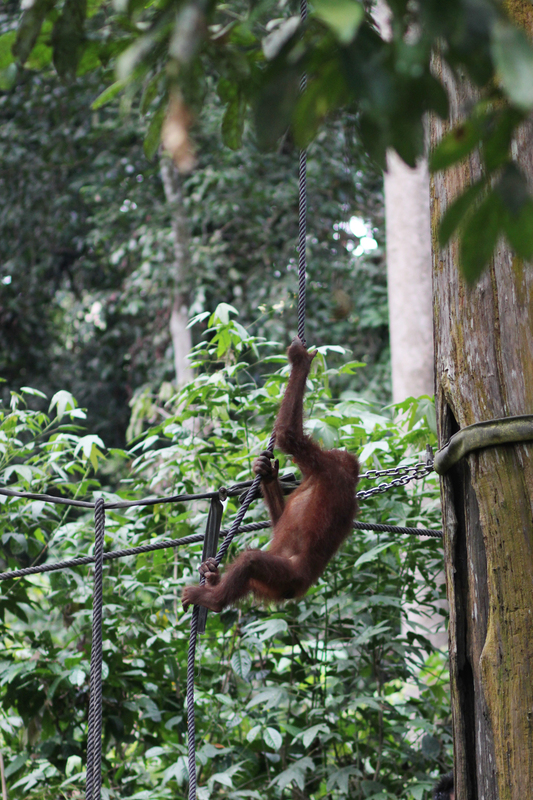 - and had an unobstructed view of the platform from which the orangutans would receive their twice-daily meals. Henry had a telephoto lens while I only have prime lenses - the 85mm 1.8 (for portraits) and my wide-angle 24mm 2.8 (for landscapes). ...then we heard a sound of branches crashing into each other and leaves rustling. A flash of orange as an orangutan glided from tree to tree, in that graceful mid-air ballet that they are so skilled at. He/she was soon joined by another. ...mere minutes later, a third orangutan arrived at the banana buffet. Having observed these three happy fellows sitting down to lunch, Henry and I left them to it and adjourned to the orangutan nursey. From behind the safety of a glass wall - a feature for the orangutans safety as much as ours, as baby orangutans are susceptible to catching human diseases - we saw the orphans gambol about; wrestling, play fighting, teasing - as innocently and as carefree as all baby animals should. I felt incredibly privileged to witness this mother nursing her baby! A rare sight, this orangutan herself was rescued by SORC and became a mother, bringing her little one here - a monkey daycare of sorts. It was all very lovely to see these beautiful primates so well cared for and looked after. Yet, although I was in their natural habitat, it was still after all on 'human terms' - the orphaned orangutans in the nursery weren't there out of choice, and while the ones who showed up for a free meal came of their own volition; I desperately wanted to spot one roaming wild. Then we left, walking through the rainforest, and looked up to see this critter just hangin', like the king of the swingers, oh, the jungle VIP. Excited at his first 'truly wild' and unexpected encounter with an orangutan, Henry fired away! ...and came away with this incredible shot of the aloof orangutan peering over his shoulder at us before he dashed away into the thick of the rainforest. 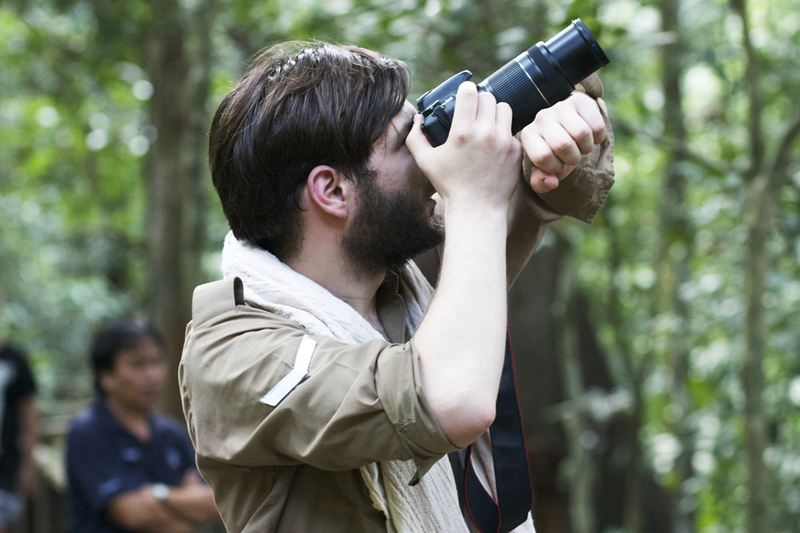 Henry felt incredibly rewarded for his efforts and patience as a wildlife photographer - having endured heat and humidity (also frustratingly boorish visitors who scared off the orangutans with their noise) - to get this shot of a rare and noble creature who had no intention of putting on a display for anyone, yet was captured on camera in a rare, fleeting moment. ...a young orangutans escaped from the nursery and ran over to the cafeteria where she tried to steal bottles of water and snacks from the visitors. The staff: "Come along now, sweetie" while the orangutan pouted like a child: "NO! I want to play with the bald, ugly, two-legged monkeys! (humans)" It was so endearing to see her being led away gently like a petulant kid being taken home by their parents haha. It is amazing that after all the trauma the orphans suffered as babies that they can bring themselves to trust humans again - to let people care for them, teach them, tell them off when they've been naughty, and take them away when they've caused trouble. More than just a place to rescue and rehabilitate orphaned orangutans, the Sepilok Orangutan Rehabilitation Centre educates the public about the orangutan and creates a sanctuary to minimize the impact of deforestation on their natural habitat as well as rescue them from becoming victims of the illegal pet trade. The SORC works tirelessly towards this noble and very expensive cause, often on limited funds. There are a few ways to help; volunteering to work at Sepilok (although I am told the waiting list is very long, up to 3 years), donating via the Orangutan Appeal UK (who are authorised to work on behalf of the SORC), and adopting a baby orangutan. Sepilok Orangutan Rehabilitation Centre | Sepilok Forest Reserve, 90000 Sandakan, Sabah. We are definitely going there when I visit next year!!! I love Henry's photos, they're gorgeous (as are yours too of course!). Absolutely LOVE this post! It looks like an incredible place! Hopefully I'll get over there one day! 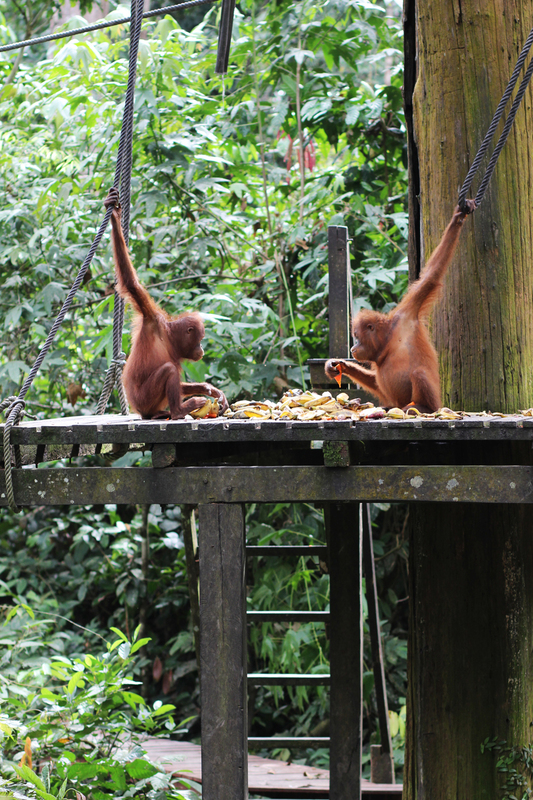 I love the picture of the two orangutans eating, each with their arm stretched out onto a rope! The symmetry is just beautiful! I love both your's and Henry's wildlife pictures! Very inspiring!